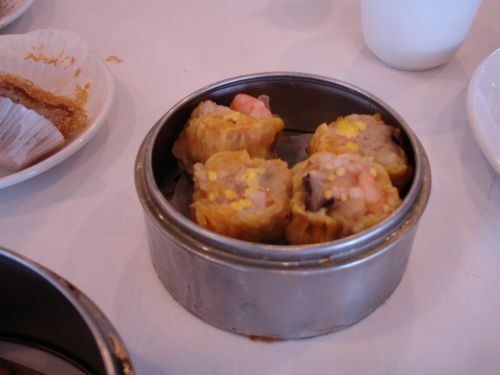 For long time I found the dim sum in San Diego to be quite disappointing. 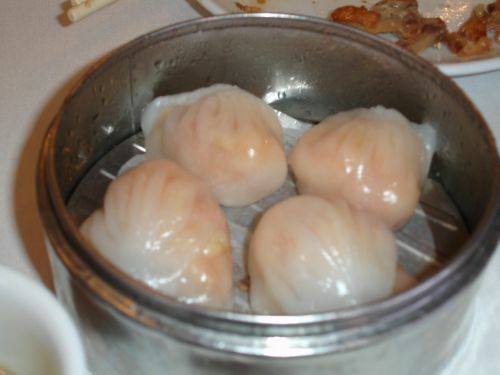 I was nearly on the verge of swearing off ever having dim sum in San Diego due to an experience in Emerald when one of the servers dropped a custard bun in front of us and tried to serve it to us later. We found out that China Max served dim sum and dinner there is pretty good though on the pricey side considering it is Chinese food so we decided to come back for dim sum. The experience here is not the normal dim sum experience at most other places. At first I was turned off by the way they served it since I had it served to me the same way at another place back in the Bay Area and the wait between dishes was so long I was about to walk out and just grab a burger from the McDonald’s next door. Anyways, usually carts are pushed around and you get to pick from the array of trays that pass by. 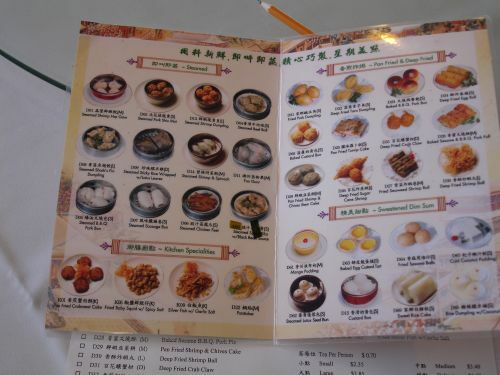 Here, they give you a picture menu and a sheet to mark down your choices and they’ll bring it out. The service as usual was good here and the dishes started coming out in a steady stream. First came the flaky taro turnovers which is made extremely well here. 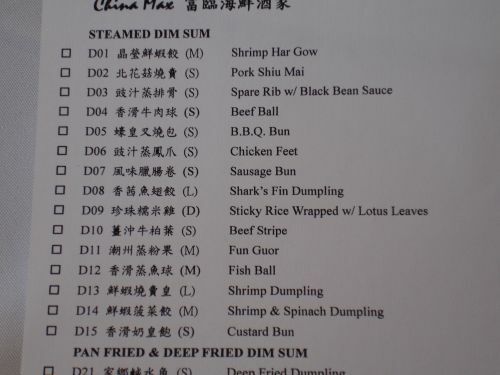 Well I think pretty much all their dim sum is made well. Even though they only make the popular dishes that people order, all of them taste pretty close to what they should taste like. Getting back to the turnovers, I tend to find that it is a greasy salty lump at most places. Here, the crust is quite flaky and there is a good portion of the meat filling that isn’t too salty. Next, the sui mai which wasn’t bad either. I love condiments and with this dish I drowned it in the chili sauce. 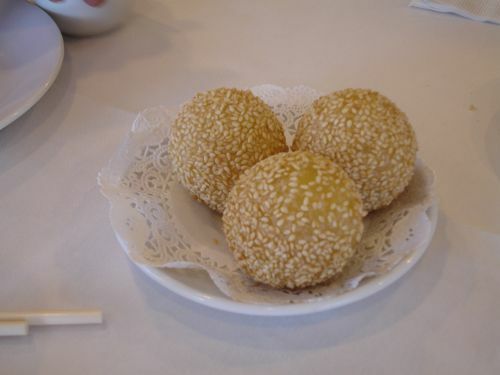 These sesame balls are one of EHK’s mom’s favorites and even though we weren’t ready for dessert she ordered it at the same time anyways just in case they ran out. EHK jokes that never in his experience at dim sum restaurants have they ever ran out. 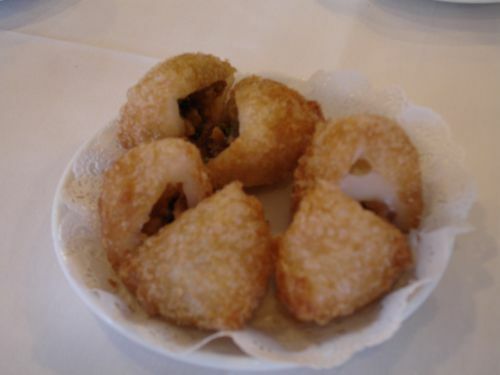 These little sesame encrusted balls have a delicious sweet red bean filling waiting inside. Bbq pork buns came out next. These have long been a favorite of mine since childhood. 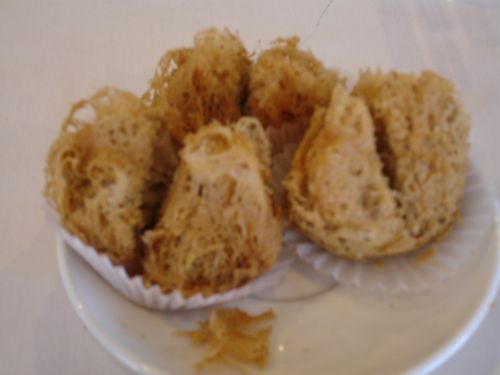 I remember the excitement of walking into a bakery in Chinatown San Francisco and my parents ordering a dozen or so of these tasty treats which were larger(dim sum to go in Chinatown is usually on the jumbo size) then taking them home to devour them. 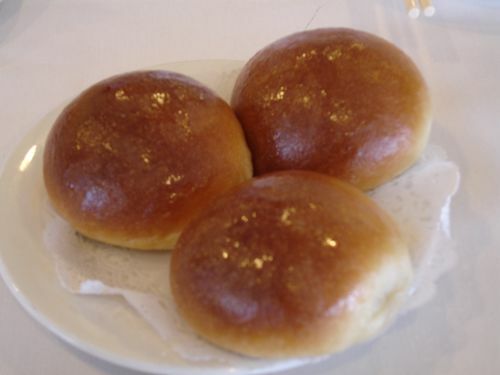 The honey toped bread with bbq pork filling is combination that I relish and is so reminicent to me today still. The meat turnovers or hom sui gok was as yummy as all the dishes that came before it as well. Another one of my favorites. I remember my first experience with it was reading a menu and coming across the name and I didn’t know what it was so my dad ordered it for me and I’ve since ordered it anywhere that serves it. The outer crust was perfectly crunchy while the glutinous inside maintained its stickiness. The filling was quite generous as well which is a plus for me. 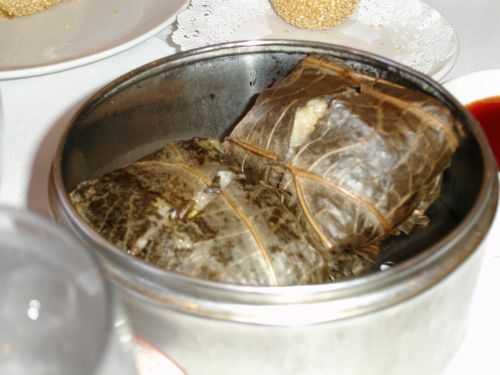 The lotus wrapped sticky rice came out next. I get so giddy when this dish comes out. The fragrant smell of the sticky rice covered in lotus leaf is just too much for me. Inside the rice is a tasty portion of chicken, chinese sausage, mushrooms and egg. The ha gow(shrimp dumpling) was tasty. I usually base my judgement of the dumpling on the wrapper since it is so difficult to make. Make it wrong and it is a tough inflexible..nearly impossible and quite unappetizing to bite through. If made right it should be soft and pliable and a pleasant experience to eat. 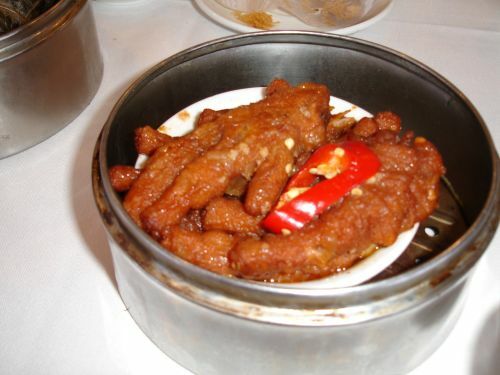 Ahh…the chicken feet finally comes out. I find that this is a dish that most older Chinese people always order and relish with delight. My parents enjoy this very much and so do EHK’s parents. I’ve tried this in different occasion and the texture isn’t bad…its just the little bones that get in the way. I think this is a turn off to younger people or non-Chinese due to the idea of it being chicken feet which is understandable.